Jemez River canyon from the Joan Delaplane Trail. Redondo Peak is at the right center of the photo. 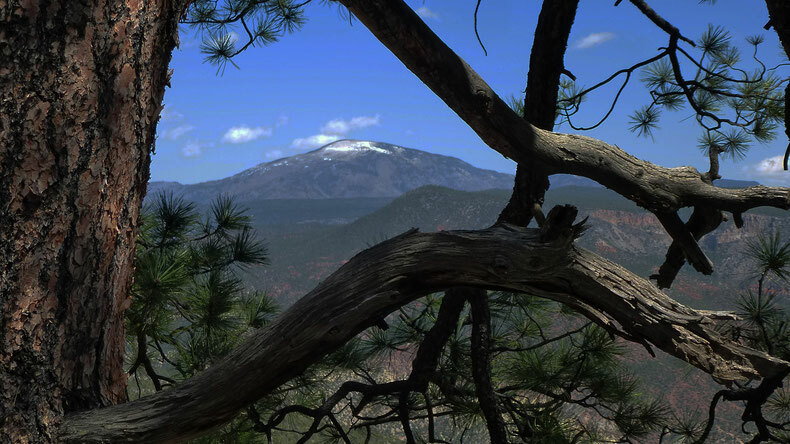 This trail begins begins at Jemez Springs and climbs to the west rim of Jemez Canyon. The first and last trail markers include the name “Joan Delaplane OP”—a reference to a Dominican sister who taught for many years. The trail is about 2 1/2 miles long and ends at the rim of the canyon. Much of the trail is easy going, if steadily uphill, and you can get some good exercise and good views by hiking the lower part of the trail. In the upper portion of the trail, a pair of hiking poles will help a lot. In Jemez Springs, drive 240 meters north on NM 4 from Jemez State Monument, then turn left on Villa Louis Martin Drive (Valles Caldera Science and Education Center). Cross the Jemez River on the bridge and park at the west end of the paved lot. (If the gate is closed, park out on the highway and scoot around the right end of the gate to cross the bridge.) An informal path starts at the west end of the parking area, at 35 deg. 46.830 min. N, 106 deg. 41.399 min. W (elev. 6280 feet). After climbing a short distance from the starting point, you will encounter an old road cut (which can also be reached by heading north out of the parking lot). The old road cut curls to the south a short distance, to 35 deg. 46.814 min. N, 106 deg. 41.434 min. W, Where the road cut splits. The shorter, steeper route goes north (right) and is badly washed out. 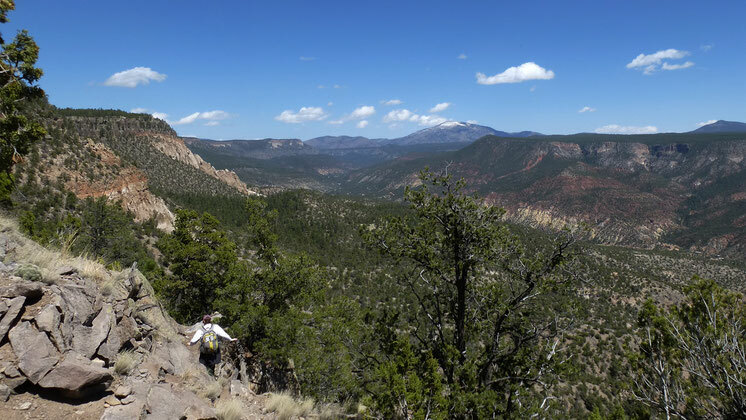 The hiking trail follows the longer, gentler route to the south (left), paralleling the Jemez River as it climbs. Soon you will encounter trail markers (orange Carsonite wands), which are numbered sequentially (1–20) but don’t seem to be distance markers. The path is well beaten and follows the old road cut, so the route to follow is obvious. After a while the old road cut starts zigzagging away from the river and up the side of the mesa. At 35 deg. 46.752 min. N, 106 deg. 41.691 min. W the shorter, steeper road cut rejoins the trail. Continue uphill (left), zigzagging but trending WNW, to 35 deg. 46.766 min. N, 106 deg. 42.273 min. There the road cut turns southwest. After having gained almost 1000 feet, the trail now climbs more gradually. Soon the road cut ends, on one side of a drainage. The trail crosses the drainage and from this point on is more sketchy—but is used enough to follow, and between trail markers there are numerous small cairns to help show the way. At 35 deg. 46.576 min. N; 106 deg. 42.460 min. W more or less, the current trail hooks up with the route of a historical pack trail out of the south end of Jemez Springs, shown on the following USGS map segment. The Joan Delaplane Trail then follows the old pack route to the canyon rim. The "Indian Ruins" shown on the map segment are now Jemez Historic Site, which is open to the public. USGS map segment showing the old pack route up the west side of the canyon. Keep following the modern trail mostly southward. Near its end, the trail starts climbing more steeply and breaks through the bluffs at the top of the canyon. This is the only obvious route through the bluffs and presumably the prehistoric people used this part of the route as well. The 20th and final trail marker, at the top of the canyon, is at 35 deg. 46.366 min. N, 106 deg. 42.589 min. W (elev.7680 feet). Once on top, wander the mesa rim or interior, have lunch, and return to final trail marker to begin your descent back to your car. It's critical to have the location of that final trail marker in your GPS, because otherwise you might not be able to find your way back down the side of the mesa.